You've gathered your tools and setting materials and prepared your substrate. It might be tempting to roll up your sleeves and start installing backsplash tile. 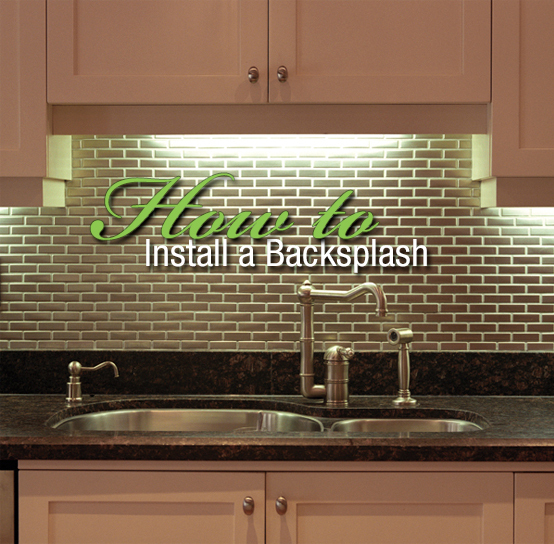 Here's a few things to know before you jump right into installing your backsplash. Smaller grout lines require less maintenance, and kitchen backsplashes are often subject to stains. Keep that in mind when spacing your tile. When designing your tiled backsplash, keep the installer – yourself! – in mind. Strive for a layout that maximizes the number of whole tiles and the size of any cut tiles. Doing a dry – adhesive-free – layout will give you an idea of how well your design will work during the backsplash tile installation. First, divide the wall into quadrants. 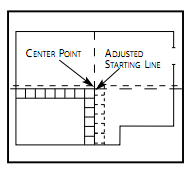 Snap a chalk line down the middle of the wall’s longest side and a second line down the middle of the wall’s shortest side, to form a perpendicular intersection. Check the intersection’s angles using a framing square. You want to carefully lay out your backsplash tile design first without adhesive before you start your backsplash. This will save hours of headaches later. To begin, horizontally measure the area you plan to tile and find its exact center. Mark the center point on your counter. Using a pencil and a level, carefully draw a vertical line through the backsplash, from the center point. This line will be perpendicular to your counter. Make sure it's exactly straight because it will be an important guidelines when you begin the actual installation. Next, lay loose tile on the counter from the midpoint to each end of the backsplash. Remember to leave room for movement joints, which will be caulked later, and grout lines. Movement joints are 1/8 to ¼ inch spaces parallel to where the backsplash will meet adjacent walls or countertops, which allow tile to expand and contract – without cracking – as temperatures and moisture levels change. Grout lines are also important – so important that many small tiles are self-spacing, meaning that they have bumps on their sides that create consistent grout lines between tiles. 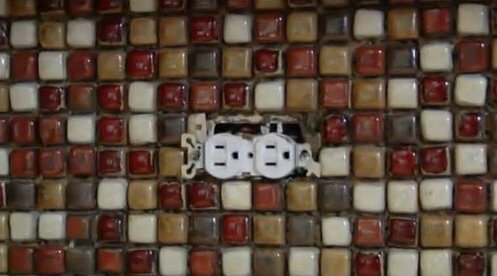 It is inevitable that you will need to cut some partial tiles to cover your entire backsplash area, including areas around outlets. To cut the tile, you may need a tile cutter and/or a wet saw. You may be able to rent a wet saw tile cutter at your local Lowe's. A "tile sandwhich" is tile that is correctly cut and positioned, and ready for mortar. Each tile you cut to fit your backsplash, should be measured and cut individually. Now that you understand how to cut tile and have completed a dry run of the backsplash layout, the next step is to begin applying backsplash mortar. Read on to the next step of our “How to Install A Backsplash Tile Guide” to learn how to do this.